Former Sen. Bob Dole was helped out of his wheelchair Tuesday to salute former President George H.W. 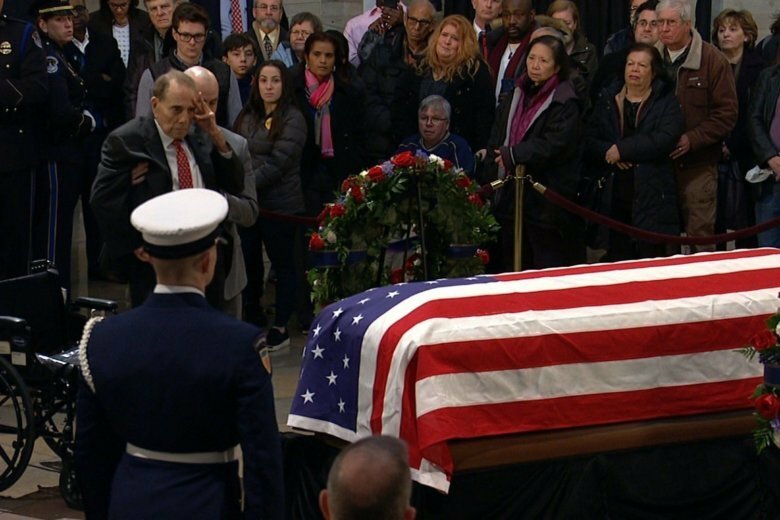 Bush as he lay in state at the Capitol Rotunda. See video of the moment. (CNN) — Former Sen. Bob Dole was helped out of his wheelchair Tuesday to salute former President George H.W. Bush as he lay in state at the Capitol Rotunda. Dole, 95, once faced Bush during the 1988 Republican primary fight for the presidential nomination but nonetheless maintained a decadesold friendship with the former president. “I believe there are certain qualities that veterans have, and when Bush was president, I think about three-fourths of Congress were veterans, and we would stick together and work together across the aisle. And, President Bush was a bipartisan president. So we got quite a lot done,” Dole said. President George H.W. Bush said a lot with socks. A visit from friend and fellow former president, Bill Clinton, inspired him to wear a pair emblazoned with Clinton’s face. At the funeral for his wife, Barbara Bush, he wore socks featuring books as a tribute to her work promoting literacy.